It's an exiting day. The collective group of creative bloggers I belong to - The Blended Blog - is debuting our Style Perspective series. This week we are styling "A Wrap". AND, my look is made up of a bargain cardigan and other great deals. I picked up this long cardigan last fall at Forever 21. It was ONLY $13! I love finding bargain deals - as I mentioned last week (with my $20 LOFT cardigan). Also, my necklace is only $8. And, it is free shipping - both ways - if you don't like - you can return it for free - just drop it in the mail. 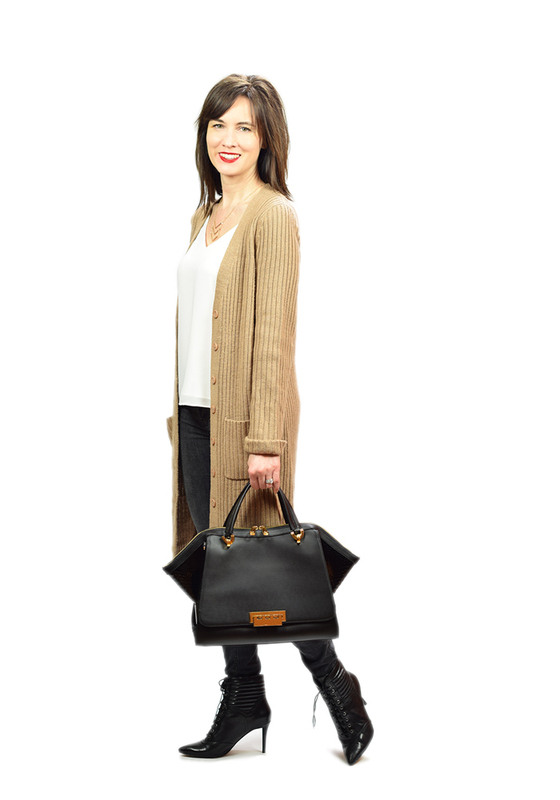 As I continue to take more photos of what I am wearing, I am really finding that I mix and match the staple pieces in my closet a lot - like my Citizens of Humanity grey jeans, Nine West boots, and ZAC by Zac Posen bag. Each week we will be styling a new “theme”. This week’s theme is “Styling a Wrap or Outer Layers”. All 14 of are showing our unique take on this idea. Our hope you will join us - and link up how you styled this theme, too. Next week’s theme is “Shades of Pink” - how do you wear pink - sweater, shoes, jeans, scarf… I may (or may not) be showing how to wear neon pink (paired with neon yellow) for spring. Be sure to join our LINK UP here. Be sure to hop around and check out ALL 14 bloggers below and see how they styled "A Wrap". Okay that's it, whenever you buy something for yourself, just buy me one too :) Loving this! hahah agree with Sarah... you can be ALL of our personal shoppers!! I am just loving the long cardigan look and neutrals, so basically I am in love right now. Plus, at that price?? Sold. Forever 21 has really upped it's game, and I am loving this long cardigan. It's the perfect piece to transition into Spring! LOVE this! I have been a huge fan of the longer cardigans and this one is great!! Hello deal!!! I'm such a sucker for tan, white and black together. So timeless! Love how you styled this outfit and I'm still in shock over the price of that cardigan! What great shopping bargains you have shared, the outfit is so cute, just how I like to dress. Thank you for sharing on the #OMHGWW this week, hope you will join us again next week! Wow! This looks great on you. I've been looking for a long sweater. What a deal! I am really looking forward to your neon post!!!! I don't have any long cardigans (it would probably be a floor-length dress on me) but I have a cozy waterfall cardigan I picked up at F21 several years ago now and I still love it! Another awesome cardigan find and outfit with these boots! That's a great cardigan and something that can be worn many ways!! I love the 'grandpa' cardigan! That is what I call them anyway. Looks cozy. What a perfect sweater and super versatile. Great look, Lisa! I have a similar cardigan that I love! Mine is from h&m and was a total steal too. Love when a good deal turns out to be one of your favorites! I would never of guessed that cardi came from F21. It looks fantastic! Love this classic color combination! I have a long camel cardigan and need to try this look. Thanks for the inspiration, Lisa! I just recently started my very own first linkup yesterday and I would love for you to join with this beautiful outfit. Thank you. The link is below.